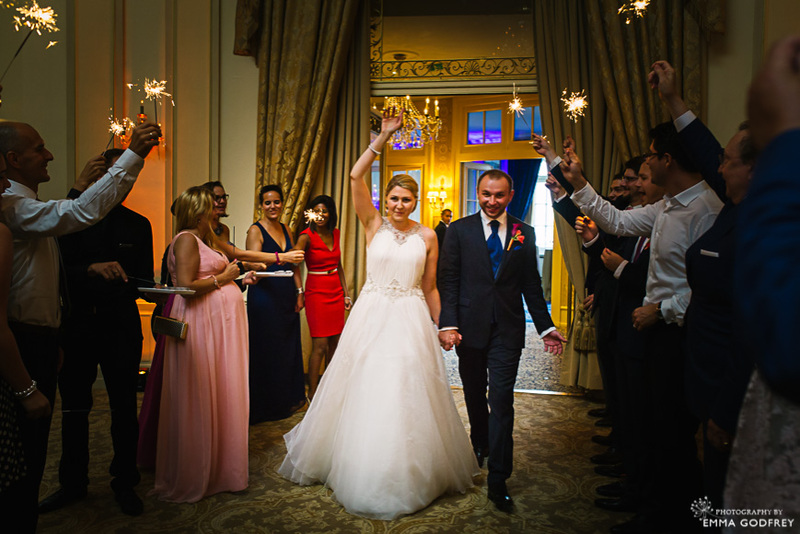 It was a scorching hot day for Elena and Goran’s wedding at the Four Seasons des Bergues, and I was glad to take refuge for a few minutes in the splendid hotel lobby before heading up to photograph the Salle des Nations. As the scheduling was tight, the hotel had managed to prepare the room and tables in time for me to take most of the detail shots before the day started. 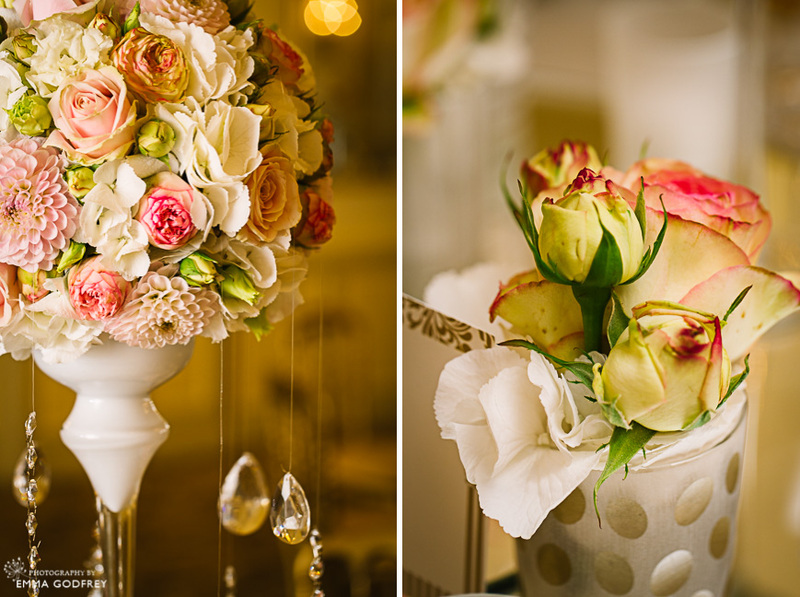 The details were something that Elena and Lucie, from Bliss Wedding & Events, had worked hard on in the months leading up to the big day and so it was good to have the time to document their hard work properly. 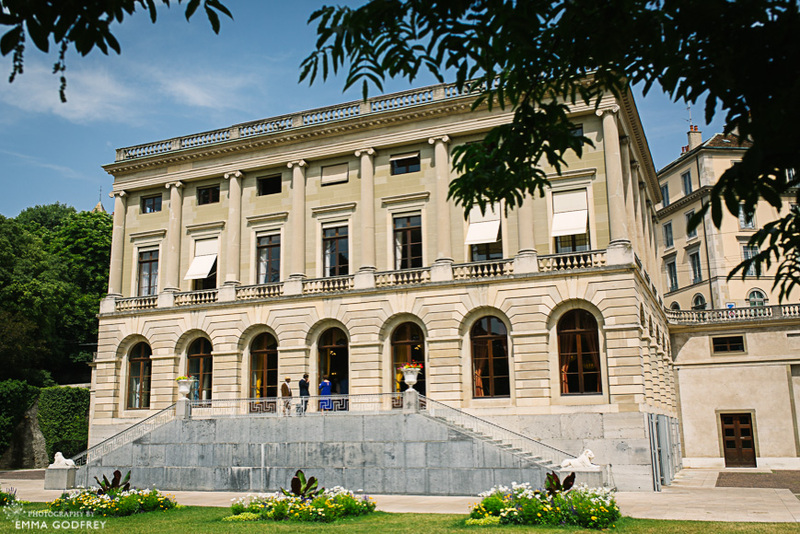 The civil ceremony took place at the very picturesque Palais Eynard in central Geneva. The city was in full bloom under a deep blue sky. 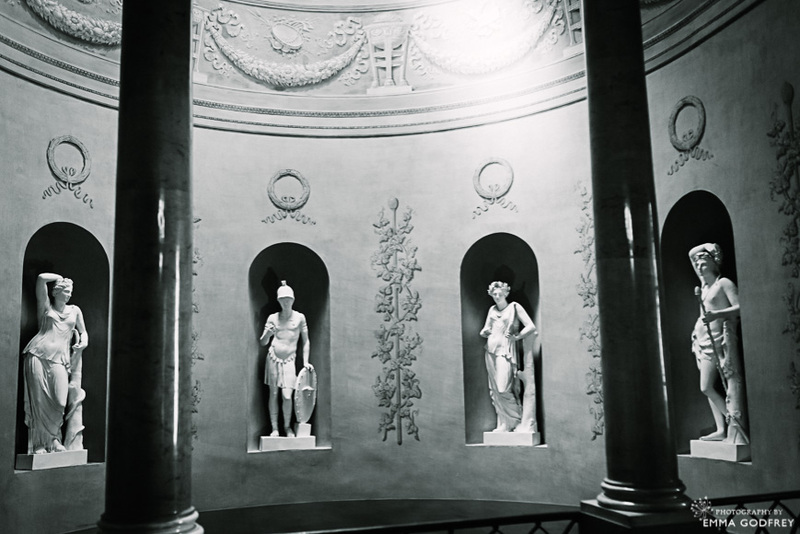 Too hot to stand for long in the sun, guests sought out the coolness of the old palace and were very glad for the cold drinks supplied to keep everyone hydrated. Poor Goran hid in the caves to keep cool in his three-piece suit and calm his nerves. 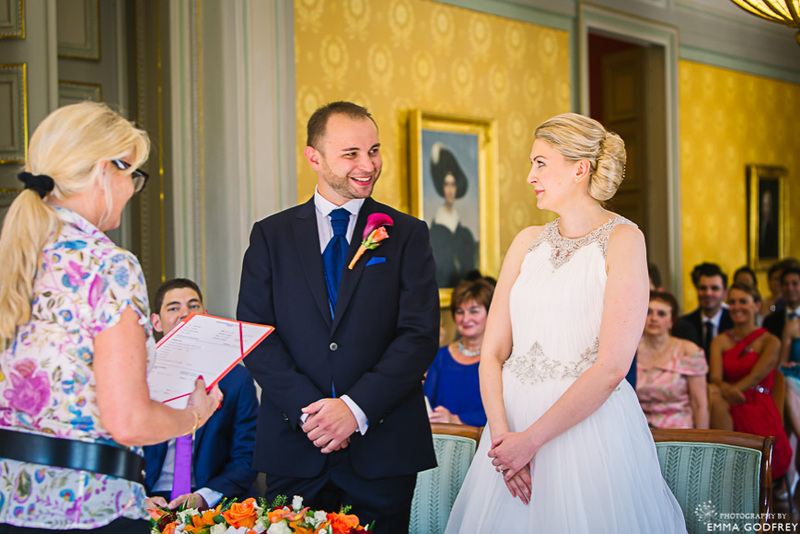 The ceremony itself took place in the beautiful Salon Bleu, with the sun streaming through the windows. 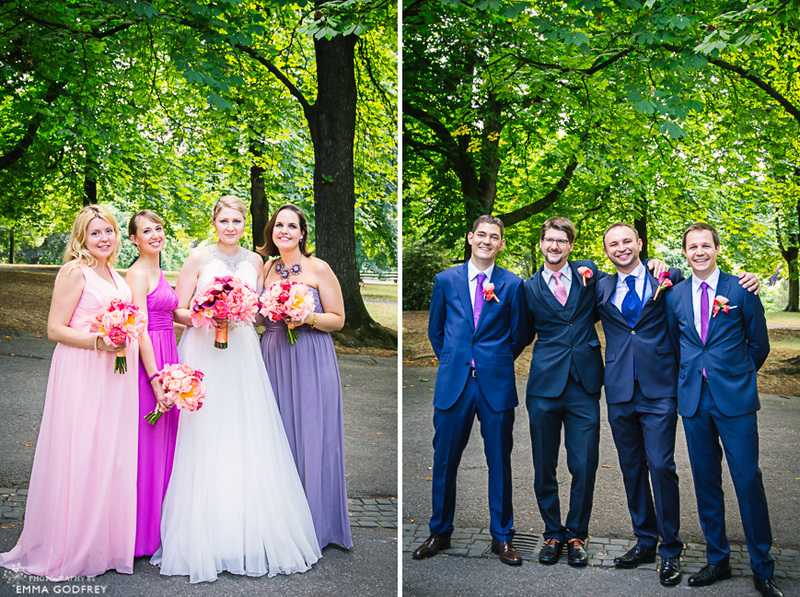 Elena looked radiant in her wedding dress and the bright colours of her bouquet. It was a friendly, happy service kept short and sweet because of the extreme heat but filled with laughter and emotion. Afterwards we showered the happy couple with rose petals and quickly got everyone together for a full group shot before retreating back into the shade. I prefer to shoot family groups in the shade because it is the best way to see everyone’s faces and avoid squinting. In the heatwave it was the best place for us. 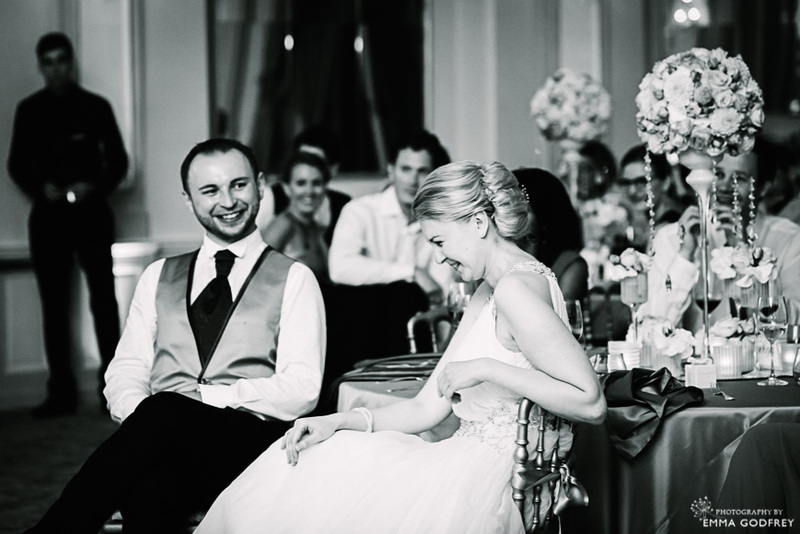 Although there were lots of group combinations to get through, the couple had planned time for the photos and it was a fun family affair with lots of laughter. 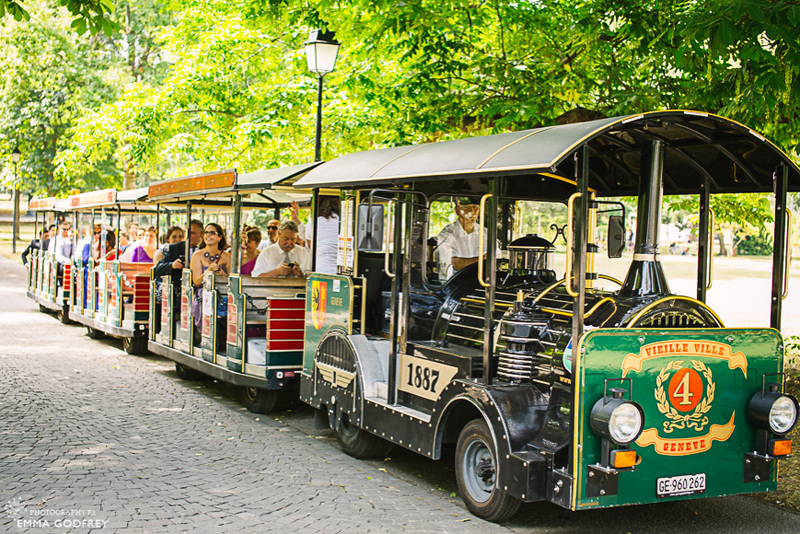 Elena and Goran had planned a tour of the city by tourist train for their families, many of whom did not know Geneva. As we waved them off our tuk-tuks arrived to take us up into the old town for photos. It was quite a hike up to the old town on the bikes but mainly in the shade and on the steep parts myself and videographer Aurélie jumped out to ease the strain. We tried to find quiet locations either in the shade or close by to make sure that the newly weds didn’t get too hot or tired. Staying hydrated is always important on your wedding day, especially in the middle of a heatwave. I would normally advice 30-40 minutes for couple photos but in this case we decided to work quickly because it was going to be too tiring for the couple to be outside for a long time. Because I had met up with Elena and Goran the week before to look at some locations for their photos we already had a good plan in place and were able to get the shots they wanted quickly. Back in the Four Seasons des Bergues in the Salon du Lac, and in the air conditioning, the band were in full swing and Lucie and the hotel team had created a wonderful ambiance for the cocktail hour. 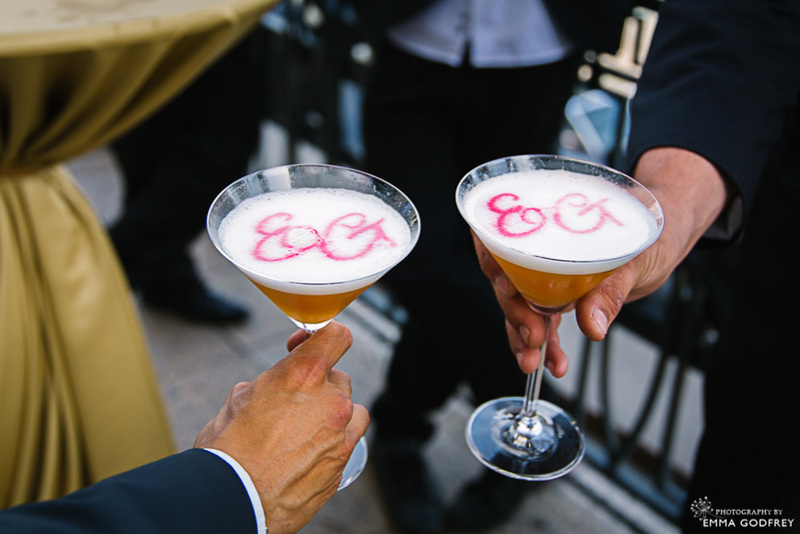 Signature cocktails were served out on the hotel balcony overlooking the jet d’eau and the guests took full advantage of the breeze to cool off and congratulate the happy couple. 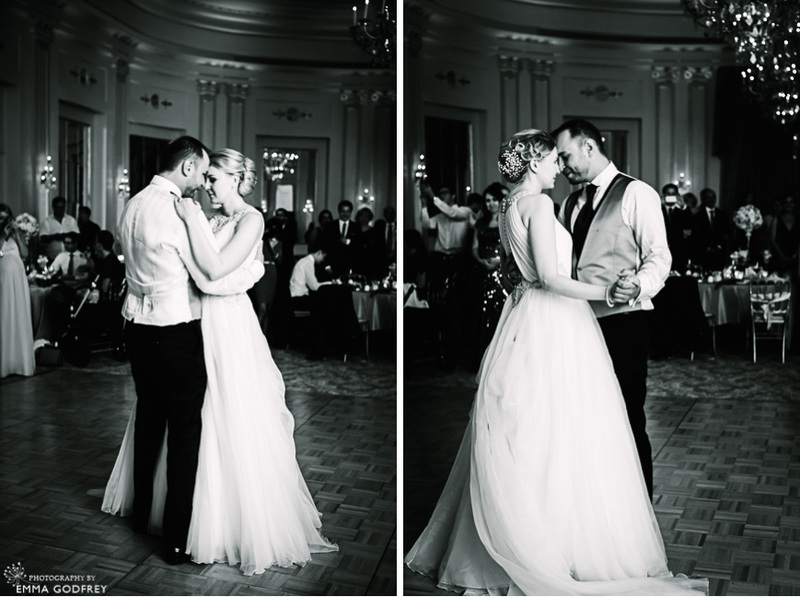 The Salle des Nations and wedding dinner were a wonderful blend of elegance and simplicity. 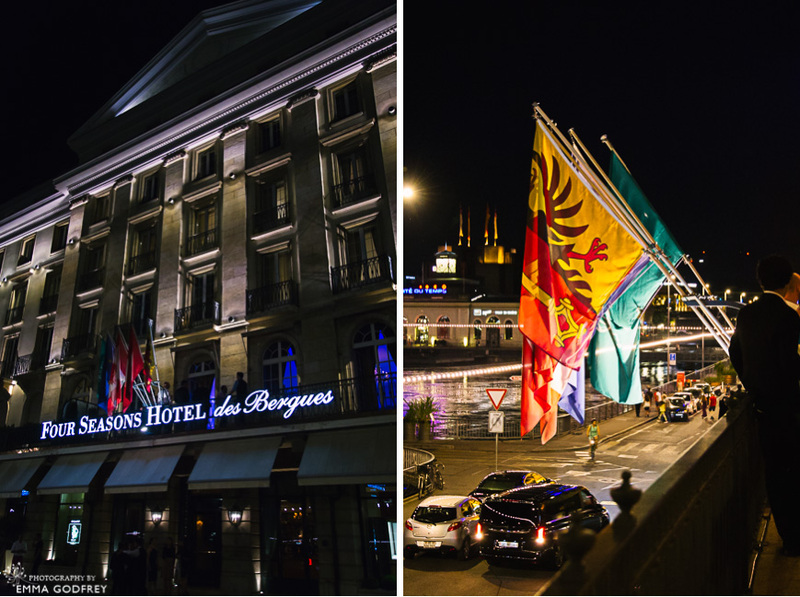 The combined efforts of Bliss and the team at the Four Seasons des Bergues created an atmosphere and decor that were in perfect keeping with Elena’s grace and style. Lots of little touches meant that, even though the wedding party was quite small, the room felt as if it were made for an intimate gathering as much as for a large party. There was a wonderful spirit during dinner and speeches, with a real sense of two families coming together as one. The hotel catering team had laboured long to create Elena’s dream tiered wedding cake and it was a great success. After the first dance the party really started with more signature cocktails amid clouds of dry ice for a really unique experience.